What is Self Paced course? Self paced course is meant for students looking for online resources to prepare for the test. It has online student learning portal developed by The Princeton Review. It has tests, drills, videos and other learning content. What is Blend course? Blend course is a combination of Self paced course and Instructor led structured doubt clarification. It has 8 sessions of doubt clarification. How does doubt clarification work in Blend course? All the concepts tested on the test are divided in to 8 sessions. Each session has a list of concept for the doubts that will be clarified in that session. Students need to send their doubts to the allocated trainer at least 2 days in advance to get their doubts resolved on priority in the doubt clearing session. Can I utilize my 8 doubt clearing sessions for some selected sessions only? Yes, you have the flexibility of utilizing your sessions on one, two or all the concepts. How will I get to know about the concepts for which the doubts will be clarified in the next session? On enrolment you will receive a calendar of doubt clarification sessions happening for that month. You can choose accordingly and prepare your lessons. What’s the frequency of doubt clarification sessions? There will be two sessions every week, one for Verbal section and one for Quant. What is the validity of doubt clarification sessions? The validity of doubt clarification sessions is 6 month or 8 sessions whichever happens earlier. How will my doubts be clarified? You will get a link for the session, on clicking the same you will be able to join the session online and get your doubts clarified. Can I upgrade my course variant? What is Live Online Course? Live online course is an online classroom program. A certified expert trainer will deliver the course in an online classroom. What is 1 on 1 Live online tutoring? What is the validity of the online course? The validity of the online course is Six months for student portal. For the doubt clearing sessions under Blend course, validity for doubt clearing sessions is 6 months or 8 sessions whichever is earlier. Through E-mail assistance you can share your doubts with trainers before the doubt clarification session and get your doubts clarified on priority during the session. What is unique satisfaction guarantee? Under Unique satisfaction guarantee you will be allowed to attend the course again within six months from the date of enrolment. What do I get in Blend course? In Blend course you get access to online learning portal, study material and 8 sessions of doubt clearing with certified expert trainer. What do I get in a Live Online course? In a Live online course you get access to online learning portal, study material and Live online classes with certified expert trainer. What do I get in 1on1 Live Online tutoring course? In 1 on 1 Live online tutoring course you get access to online learning portal, study material and 1 on 1 live online classes with certified expert trainers. You can either make the payment through the online payment gateway on our website or speak to our counsellor for making through bank transfer or at any of our centres. What requirements must I meet to access my online content? Hardware: 512MB of RAM, 20-25MB of free disk space. The latest version of Java must be installed and enabled. Adobe Flash and Reader must be installed. If any of your settings do not match those listed above (or if you do not have Java, Adobe Flash, or Adobe Reader installed) you will see an error on your Student Dashboard that says “Your settings don’t meet our minimum requirements. Get Details >>”. If you click “Get Details” you will be taken to a screen that lists all of your current settings, with instructions on how to update them if they are incorrect. How should I get started with my online course? Click on “Get Started” and then “Welcome” to access your welcome page. Each welcome page includes an online lesson plan. This plan presents guidance for what to do when, based on how long you have to prep. How do I use the student portal? How can I navigate through my online content? Below you will find an example of the “My Online Content” section of a Student Dashboard. Note that the “My Online Content” section of your Student Dashboard may contain different content. Categories are displayed on the left in gray. When you click on a category, topics are displayed in green boxes. Click on any of the topics to pull up a list of associated content. Then click on the specific piece of content that you want to launch. If you choose the “Leave Page” option, your Student Dashboard will close and data entered into your online content window may not save. How long will I have access to my course for? You can view the length of your online entitlements right in your student portal page. 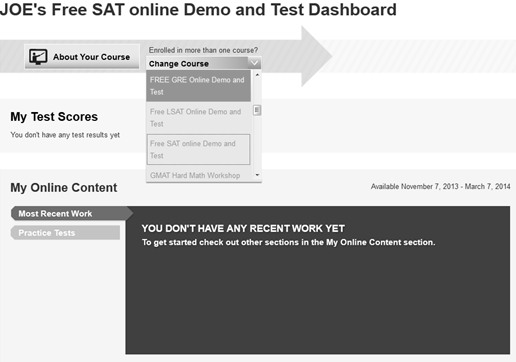 The dates that your course is available to you displays right next to the “Launch Online Content” link in “Current-Test-Prep”. In the Security Settings window, scroll down to Scripting and click the Enable button for Active scripting. Click the Wrench (Spanner) Icon to the right of the Address bar and select Options. In the Options tab, click Under the Hood and then Content settings. Click the X in the top right corner of the Content Settings screen to close. On the web browser menu click Tools and select Options. In the Options window select the Content tab. On the web browser menu click Firefox and select Preferences. In the Preferences window select the Content tab. On the web browser menu click Safari and select Preferences. How can I make sure that my version of java is up to date? What are these security warnings that I see when I am on my Mac? 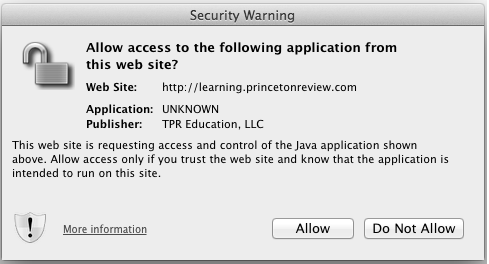 The Princeton Review’s content is on a safe and secure server and is not a security risk. 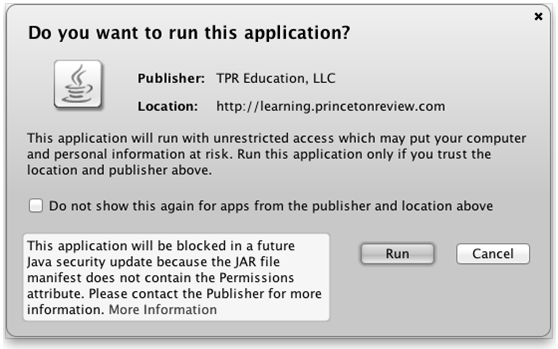 Please check the box for “Do not show this again for apps from the publisher and location above” and then click the “Run” button. Click “Allow” and your online content will load. Note that if your Java is not up to date, you may see a slightly different message. In the second window, you may need to click a “Don’t Block” button rather than an “Allow” button. Can I retake an online practice test? Absolutely! 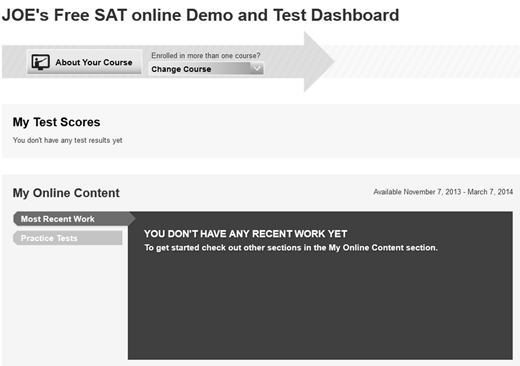 You can retake your online practice test as many times as you like. Each time you take the test will produce a new score report in the View Test Scores tab. In order to retake a GMAT test, you must first delete the scores on the previous exam. After deleting those scores, you will not be able to view them, but you will be able to retake the test. Where can I download the latest version of my browser? Can a student from outside India enrol for online courses? Students from India, Nepal, Sri Lanka and Bangladesh can be enrolled for Online courses.